As an Internet Marketing Agency is about providing web design, hosting, and search engine promotion, by offering affordable web services to small and medium businesses, and individuals who want an online presence through out the in the state of Wisconsin. We are a growing Wisconsin company based out of Marshfield, but often enough we are found online via search engines and are referred to work with businesses all over the United States and Canada. We were formerly known as CrusHosting Or Crushosting.com short for Computers R Us Hosting when we were based out of Colby, WI. We changed our name when we sold off our computer & cellular businesses. We then put all of our energy towards our successful web business and added services that we were providing for years but was not activlely marketing as business was coming in very naturally. 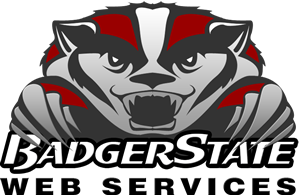 When we decided to change our company name to “Badger State Web Services” we came up with it because of the meaning behind the powerful reputation, the outstanding motivation, the drive and the work ethic of the UW Wisconsin Badgers and all their well put together and excellent sport teams. The whole organization knows what dedication is in practicing and training hard to have winning teams for their fans and themselves. This reminds us how we want run our company and to treat our customers by letting them know we are here to give our best in continuing our education, working smart, hard and strive to be the best in our industry. We love what we do and are very passionate about our service offerings. Our Local Internet Marketing Firm isn’t like some of those big SEO companies. We don’t promise “First Position on Google” which can’t be guaranteed to accomplish, or that service that has hidden fees. Whether you are just starting your first small business website, or you are running a big eCommerce site, we prepare a plan for every customer specially. Badger State Web Services also has respect for our customers time. We are not going to send you a hundred of new various proposals, and our website doesn’t have any marketing traps. The only emails you will get from us are related to our business engagement, customer service or billing. On the other hand, your emails are always welcome, whether they contain criticism, praise, suggestions, or entirely something else. We want to know what you feel about our services, because we aim to do the best job we can on your projects. You are welcome to contact us, read our blog, check out our FAQ or send us some questions and or leave us a review on Google, Yelp or Facebook and Angie’s List.